It’s been hard to convince Arabs that Abdel Basset al-Megrahi was released only on compassionate grounds. They’ve been calling his release a deal and they’ve been discussing the facts as well as the fallout, the noise and controversy that ensued. For the rest of the Arab world, it was considered a deal early on. First, the timing was suspect. 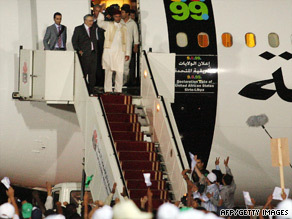 His release occurred one day before the beginning of the holy Muslim month of Ramadan, about a week ahead of Libya’s 40th anniversary of the revolution that brought Moammar Ghaddafi to power, and a month before Ghaddafi’s planned trip to the US where his visit - and the air-conditioned tent that will house him - are already the subject of controversy. Then came the hero’s welcome, which effectively sealed Arab suspicions. And if that wasn’t enough, Ghaddafi’s son and heir apparent, Saif al-Islam, spoke to a local station and said that al-Megrahi’s release was part of every negotiation with the British government. He said it was part of a “trade deal” struck between the two countries. These comments angered the UK and the US but overjoyed the majority of Libyans and got some Arab editors and commentators talking. For most Arabs, this is a business deal. Columnist Obaidaly Obaidaly says “al-Megrahy is just one element of this deal which involves closing the Lockerbie chapter forever and opening a new chapter in relations between Libya and the west.” According to Kwaileet, oil, gas, technology and defense contracts involving primarily U.S. and British companies are likely to be signed, if they haven’t been signed already. The facts remain the same. The only man convicted in the Pan Am flight 103 which killed a total of 270 people, mostly Americans, walked free with a big smile. He received warm congratulatory hugs by one of the most influential people in his country, and the first words he uttered publically were a declaration of his innocence. So, if Scottish authorities cite compassion as the grounds for his release and Libyan leaders talk about his release as an integral role in “deals,” does that make al-Megrahi’s release a compassionate deal? The Arab world has a history of searches for the “truth” between assassinations, coups and revolutions that bring leaders to power for decades or for life. Many Arabs, especially intellectuals, think that they can trust western governments with the truth. Judging by the reaction, this is one case that’s making them re-consider. Most of the Pan Am 103 victims were Americans. It is in this country that the outrage is loudest against the release of al-Megrahi and the hero’s welcome he received in his native Libya. So how will Americans welcome Ghaddafi when he lands on US soil and heads to his mobile home (an air-conditioned tent that travels with him wherever he goes) in New Jersey in September? One can only imagine. I just want to tell you that I would much rather have Mr. Ghaddafi as a neighbor, tent and all, than that weasel Rabbi, whose buddies sell human organs for huge profit. I had a good friend on this flight, life in prison should be just that. The only way this terrorist should have been allowed out of prison was in a body bag. As for compassion, where was the compassion for my friend or the others on the flight that day, not to mention the people of the ground. Re the basis of the article that it is related to trade deals. I can see no concrete evidence only what amounts to conspiracy theories of so called experts or Arabs who have thier own views depending on thier political interests. And you do say that Britain and America are beneficiaries of national sovreignty decisions to get Oil and gas supplies ( same reason the US invaded Iraq!? His cancer is said to be terminal ( 3 months not 3 weeks). If it turns out not to be then the conspiracy theories have more gravitas, but not until then. This kind of rumour mongering speculation, conspiracy theory is unjustified evidentially at present. It may seem disconnected but I am now not the least surprised that many of my fellow Americans are more concerned about socialism in Health care and not the compassion appropriate at this time to this individual and the 30 – 47m Americans who have no health care!! Please note there is also some doubt about the evidence that convicted this man in the scottish courts. Give me a shred of real, provable evidence and I will shut up, till then you should stick to real facts, and not rabble rousing!! If he lives beyond 6/12 months and especially if he resumes a political/commercial role in Libya Outrage, outrage, and total condemnation should descend in full force on the UK from anywhere and everywhere, and include the US who evidently failed to intevene strongly enough! In referring to the Scottish Embassy we see a familiar level of American knowledge of geography and world affairs. It would be comical it it were not for the world's natural fear of the size and reach of the US military machine. America welcomed Jerry Adams, one of the most famous terrorist leaders at the time to the whitehouse. The US later negotiated a deal to release hundreds of young healthy, unrepentent terrorists in N.Ireland into the communities of their victims families. The arrogance of America and their indifference to terrostist victims (unless they are American) is astounding. Releasing this one dying man has done the world a favor by exposing the insincerity of the Libyan government. BTW it is none of the US business if Scotland applies it's own legal system as it has a perfect right to do so. The guideline for compassionate release is three months, Not 3 week as stated earlier in the blog. Arabs aren't the only ones that are unconvinced. I agree with Bob, CNN should keep tabs on this bomber and see how things are in 3 weeks. I bet he is healthy also, and if something does come up and they have a cover up that he did die; maybe they will give him a new face and new identity so he can bomb again. The Scottish official should be ashamed of himself and should take in the bomber himself-the IDIOT/FOOL. Yes alot to do with greed/oil etc to. Our Country should protest and speak out against this monster every day. Its really disgusting! Jean is right let the terrorist stay at the Scottish Embassy, (You should be in the White House). We should not even allow this lybyan leader to stay indefinitly in our Country. Let him fly back and forth and do his business that way. THIS IS OUR COUNTRY. No respect is shown to the families that lost loved ones on that plane. Our Government shoudlnt hesitate to make him stay in a tent someplace. He doesnt deserve any more. He welcomed the bomber to lybya-like a hero, maybe things would have been different if ghaddafi would have spoken out against this bomber? I think CNN should keep a ticker/counter.... number of days alive since his compassionate release. No way this guy has only 3 weeks to live....let's highlight daily the travesty of his release. Compassion? His bomb on the Lockerbie Pan Am flight showed no compassion – it killed indiscriminately in the air and on the ground. After watching news reports of this terrorists homecoming and hearing the stories of a business deal, I began to wonder if the man even has cancer. So nobody wants the lybyan leader staying near them on his NY visit. The Scottish are compassionate, let him stay at the Scottish Embassy. What I found really rather odd and unusual and strange was how that Scottish official(yeah I forgot his name) who claims to have made the "official" decision to grant the "compassionate" release, felt compelled to make this monsters medical records public. They scanned all the pages and posted them online. I can't recall that being done before for any other type of prison release. Is it standard practice. I also question the validity of them and if the doctor actually saw him. The only thing I see is a deal. Compassion is insulting. Let's just be honest, it was business deal made mostly on the blood of American lives. Its absolutely disgusting what Prince Andrew did. This goes well beyond crossing the line. What these families have had to go through. It always never ceases to amaze me the attention put on murderers and their needs verus the families and their life long pain and suffering. I guess oil deals are more important than the blood lost to terrorism. How sad and infuriating for the victim's families & friends. There was no compassion shown to them while this "trade deal" was brokered.